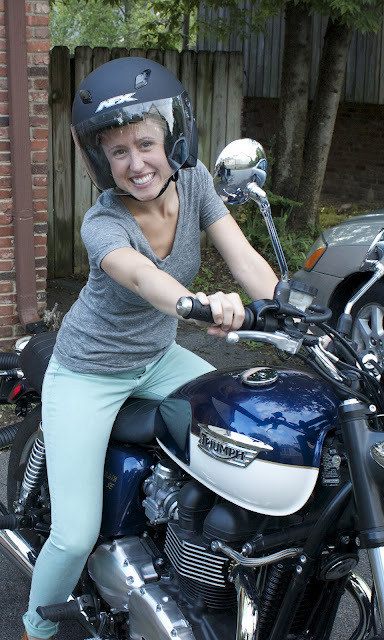 I just went on my first motorcycle ride - and IT. WAS. AWESOME! Thank you boyfriend for going slow... you knew I was serious about peeing my pants! um, yea... I look pretty bada$$ as a bobble head! Hope you have a little adventure this weekend too! Love those jeans! I want a motorcycle . your daddy refuses to look at this post! that's awesome! sounds like so much fun!!! I was terrified when I first went for a ride on my hubby's Harley but I quickly learned to love it! I've now been riding with him for 5 years but I still hate going on the highway...the slow local roads are so much better. :) I have a really similar helmet and I like to joke that I look like an astronaut in it, haha. I also have a full faced helmet but that one gets too hot in the summer! My boyfriend is OBSESSED with his new toy... only had it for about 2 months, so I let him get in a lot of practice before hopping on the back! Ooh that sounds like so much fun! Thank you dear, do you have a blog I can check out too? Oh a Harley! What a fun toy! Yes, we are sticking to the back roads for now... even the thought of being on the interstate scares the bajesus out of me! Ahhh! I haven't been on my bf's bike yet. I insist he needs more practice first. You're so brave! Be careful! My husband and I enjoyed riding his Harley together until he sold it last month. For both of us the prospect of leaving behind a beautiful daughter was too much to handle.